As spring begins to move into summer, more and more vegetables and fruits are popping up at Mission Community Market each Thursday. This past week Tomatero Farm introduced the season’s first zucchini and yellow summer squash, while Blue House Farm across the way had bundles of fresh mint… If you’ve never combined zucchini and mint together, this week’s recipe is a must try! The sweetness of the zucchini is highlighted by the mint when sauteed in fresh olive oil. Combined with Home Maid Ravioli‘s fresh pasta, this dish can be served during spring and summer when the temperature rises and our palates crave cool, sweet flavors. First, slice the zucchinis very thin, similar to the shape and size of the linguine you will be combining it with. Heat the cup of oil in a heavy skillet over moderately high heat until hot, but not smoking. Fry the sliced zucchini in three separate batches, stirring occasionally, until soft, pale, and slightly golden (about 3-4 minutes per batch). Transfer the lightly fried zucchini by a slotted spoon to paper towels to absorb excess oil. Once all of the zucchini has been fried, add the chopped garlic to the remaining oil and slightly brown to infuse the flavor into the oil. Remove skillet from heat. Cook pasta in a 6-8 quart pot of boiling salted water, uncovered, until al dente. Reserve 1 cup of the cooking water. Drain pasta in a colander and transfer to a large, shallow bowl. 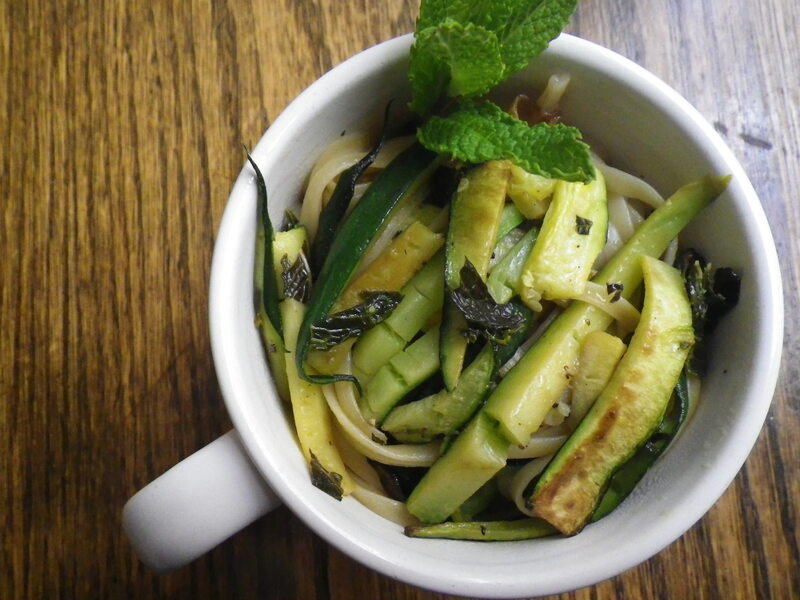 Toss pasta with garlic oil, fried zucchini, mint, zest, lemon juice, salt, and pepper. Add some of the reserved cooking water to moisten if necessary. Continue to salt to taste. Serve with warmed bread from Marla Bakery. 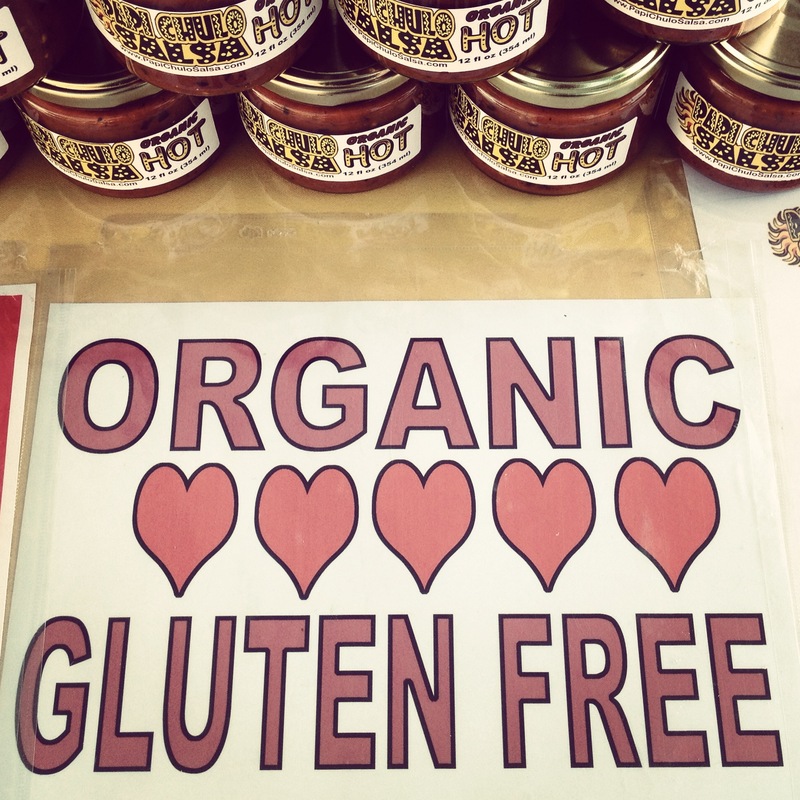 By now, many of you know that Mission Community Market is no ordinary farmers market. Besides fostering community, promoting family health, and engaging local youth, our market helps local businesses thrive. MCM diversifies our vendors, reducing competition and providing a wide variety of hand-made, hand-grown products to everyone that enters. This week, we welcome our newest addition to the market: Crystal Eyes. 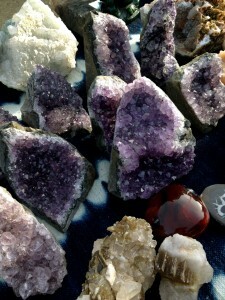 Each day, there are new people that are drawn to her, she watches the days change before her eyes, and loves seeing how these gems have the power to connect people. Though opening her own store isn’t in her immediate plans, she’s hoping to sell her wares at the Treasure Island Flea Market in the near future. All of the items that lay upon her beautifully decorated table are naturally-found materials. 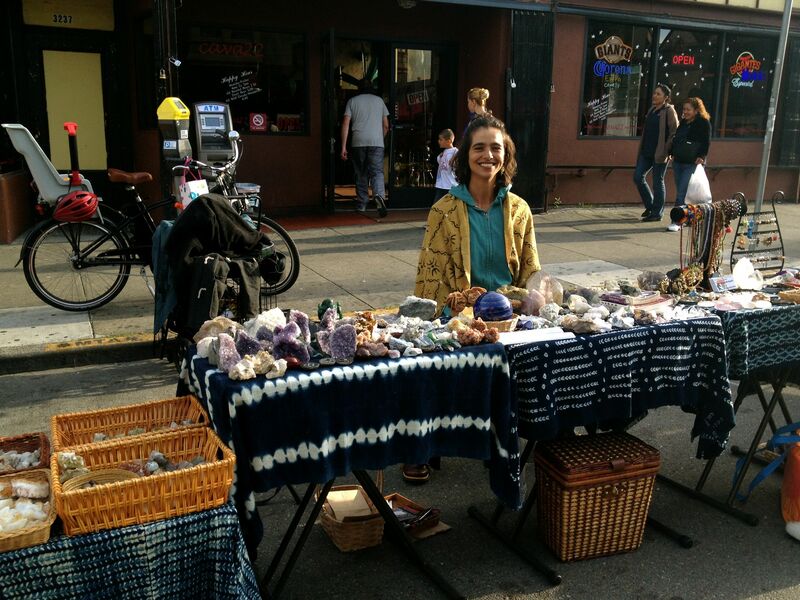 She mainly sells crystals, jewelry, incense, sage, and palo santo at the market each Thursday from 4-8pm. 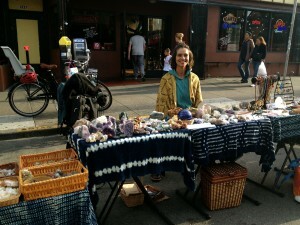 Stop by this week and strike up a conversation with this San Francisco native! Spring weather is here which means it’s time to drag out that barbecue, wipe it off, and heat it up! At MCM you can now find Blue House Farm, Tomatero Farm, and Zuckerman’s Farm offering an array of seasonal, local veggies perfect for grilling. Although you can roast almost any vegetable, this week’s recipe highlights the flowering artichoke drenched in healthy oils and grilled (or roasted in the oven) to a crisp, hearty perfection. You probably have a bottle of olive oil sitting on their counter for use during cooking, but what you may not know is how beneficial olive oil is to one’s health. A study conducted by the New England Journal of Medicine found that those who ate up to four tablespoons of extra-virgin olive oil a day cut the risk of heart attacks and strokes by 30 percent compared to other low-fat diets. This recipe uses fresh extra-virgin olive oil to enhance the flavor of the artichokes while providing you with a heart-healthy dose of deliciousness! Cut off the top 1/3 of artichoke and trim the tips of leaves. Fill a large pot with enough water to cover artichokes, and add 1 cup of white wine and 2 tablespoons of lemon juice to the water. Boil the artichokes in the water, wine, and lemon juice for about 25 to 30 minutes until soft. 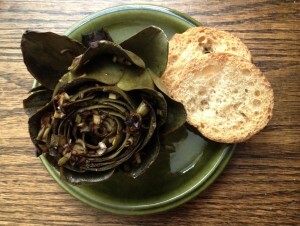 The wine preserves the color and gives the artichokes a deep, unique flavor. Set aside the cooked artichokes and prepare the marinade by combining 2 cups of olive oil with 1 cup Balsamic vinegar, 2 stalks of fresh green garlic, 1 tablespoon fresh oregano, 1 teaspoon fresh thyme, and 1 teaspoon fresh marjoram. Add salt and pepper to taste and mix well. Once artichokes have cooled, spread the leaves out slightly with a spoon to allow the marinade to infuse into all parts of the artichoke. 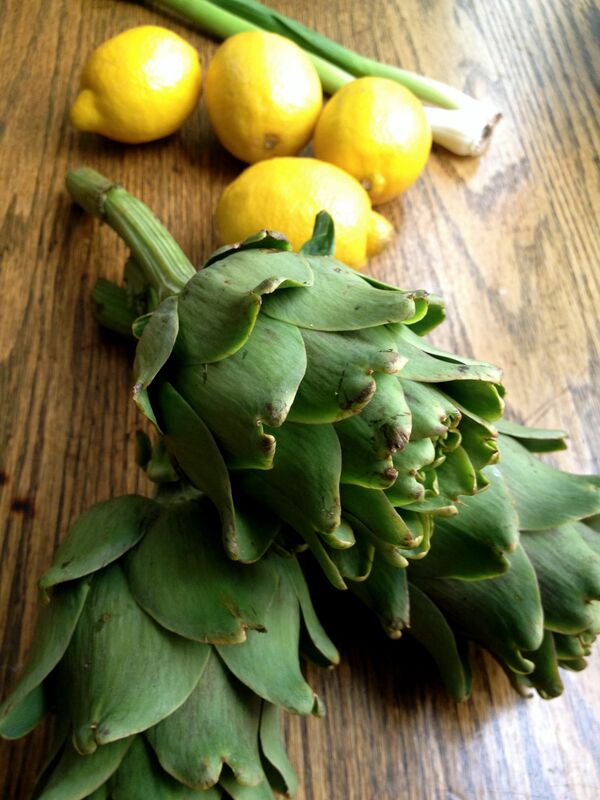 Drizzle artichokes with the marinade, setting aside enough to coat each artichoke after cooking. 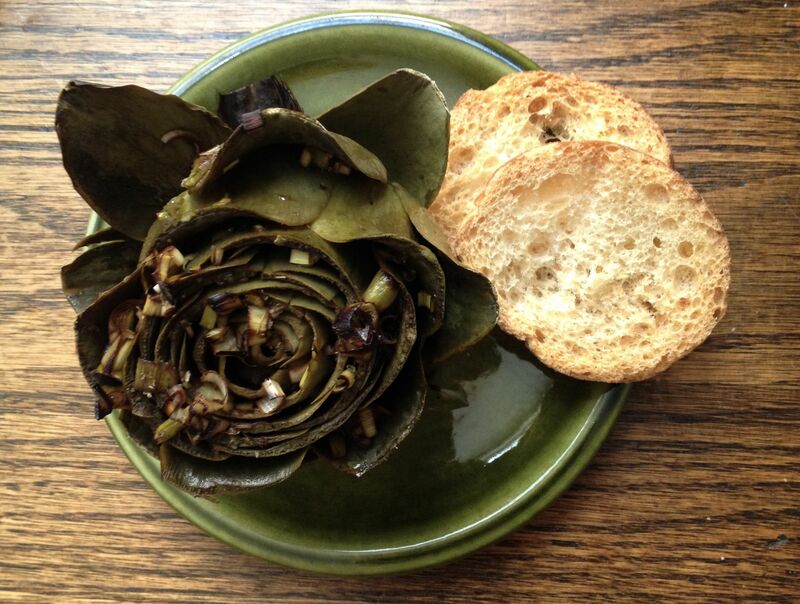 If you would like to grill the artichokes: Wrap each artichoke individually in foil. Place on hot coals in grill for about five to seven minutes. Remove from foil and brush with remaining marinade. Serve hot. If you do not have a grill, roast them in the oven: Place the marinated artichokes on a pan and cover with foil. Bake at 400 degrees for about 7 minutes. Remove the foil and broil for another 5 minutes to crisp the tips of the leaves. Brush with remaining marinade. Serve hot. There is never a dull moment at Mission Community Market and thanks to Roberto Biggs at the Papi Chulo Salsa stall, the vibrancy radiates from 4-8pm each week without fail. Inspired by the salsa at a local Mexican restaurant, Roberto Biggs tested out many different recipes to try to replicate this spicy treat. Through many years of trial and error (like deciding whether to roast merely half of the garlic or the entire head) and balancing the proportions of the ingredients, seven and a half years later he has created what he believes is the perfect salsa. Many blind taste tests were done with the help of friends, relatives, and local business owners. Finally, the salsa went commercial on March 31, 2013. Now one year later, Papi Chulo Salsa can be found at farmers markets in San Mateo, The Castro, Glen Park, and of course our very own Mission Community Market. His products are also found in Aisle 3B at Rainbow Grocery, and has been highlighted on three radio shows with a future TV debut lined up for April 17, 2014 @ 4:30 KOFY TV 20 on Earth Day. Papi Chulo Salsa is unique because it’s more than just a condiment. This salsa can make the simplest recipes come alive. You can add Papi Chulo Salsa to your tacos, pizzas, sopes, nachos, burritos, pastas, ceviche recipes, and more. There are four varieties of his salsa: mild, medium, hot, and very hot. 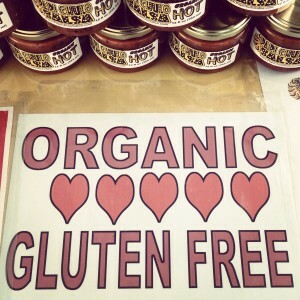 All the ingredients are sourced locally, organically, and sustainably. Roberto produces roughly 200 liters of salsa per week and individually bottles each batch immediately after production to ensure that the salsa remains at its freshest state. But shh…the secret ingredient in this amazing salsa is not onions, but oranges! Combined with heirloom tomatoes from San Benito Farm, the salsa dances uniquely on the tongue thanks to the extra tang of citrus. 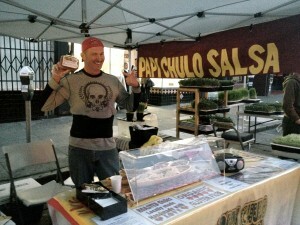 What can Mission Community Market and the patrons of Papi Chulo Salsa expect in the future? Chips! Roberto plans to hand-make his own salsa chips, with all future proceeds donated to the Breast Cancer Emergency Fund in honor of his mother. On a larger scale, expansion is the goal for Roberto Biggs, who hopes to expand past the Bay Area and into Southern California and Sacramento in the next five years. With a ten year plan of expanding coast to coast, Papi Chulo Salsa hopes to grace your table with its presence wherever you travel in the near future! Come on down to MCM each Thursday from 4-8pm to dance a few salsa steps with Roberto Biggs while you sample his amazing salsa! 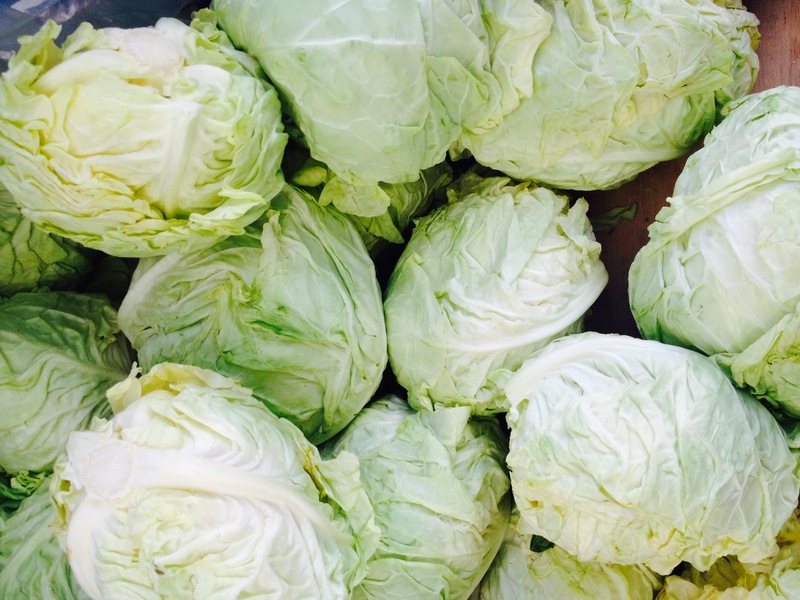 Mission Community Market is pleased to welcome back Tomatero Farm to market Thursdays! 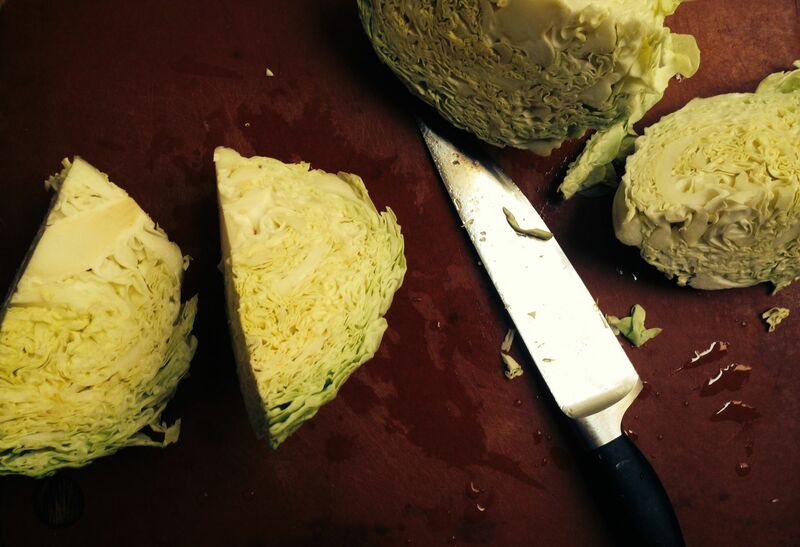 This week we have highlighted a good ol’ head of cabbage..
To some, one of the most confusing vegetables to prepare. Does one steam, boil, sauté, or bake this round, green beauty? This week’s recipe guides you in the southern style of preparing a cabbage. This quick, easy, and delicious technique will highlight the flavor and texture of this mysterious veggie. To accompany the deep flavor of this recipe, mashed potatoes and blanched carrots make for one hearty, healthy meal! The best part about this recipe is that it’s even better on day two after a night of soaking in the fridge! Cut the cabbage into quarters and slice off the hard stem. Gently slice each quarter into roughly 1-in. thick strips. In a large pot, add the butter, olive oil, salt, pepper, seasonings, and cabbage. Add in the chicken or vegetable broth and toss. Bring pot to a boil over medium-high heat. Cover and reduce heat to medium-low. Simmer for 12-15 minutes, stirring the cabbage occasionally until it is tender. Do not overcook. Chop potatoes in half and add to a pot of water. Boil for roughly 25 minutes until tender. Drain 90% of the water and mash the potatoes with butter, salt, and pepper until smooth. Add water to a pan and simmer the whole, cleaned carrots until tender (roughly 15 minutes). 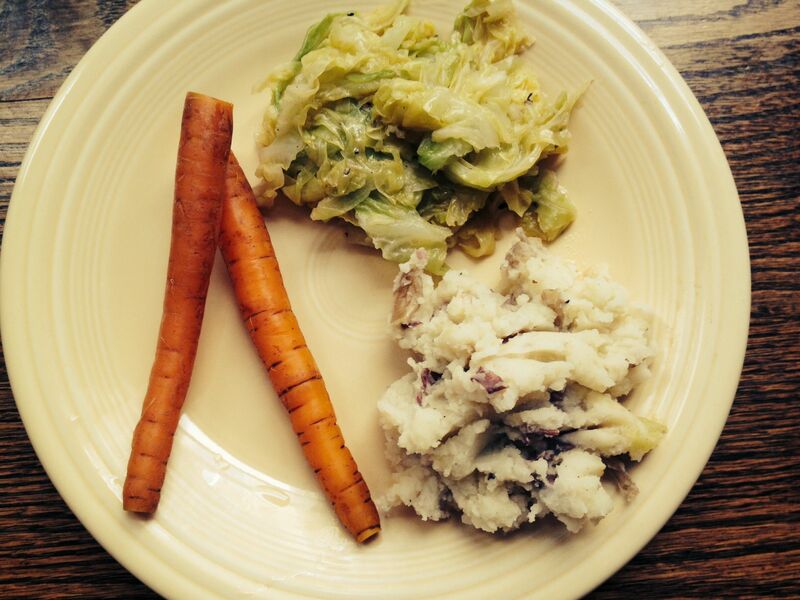 This preparation highlights the sweetness of the carrot, while maintaining nutrition and omitting unnecessary fats!